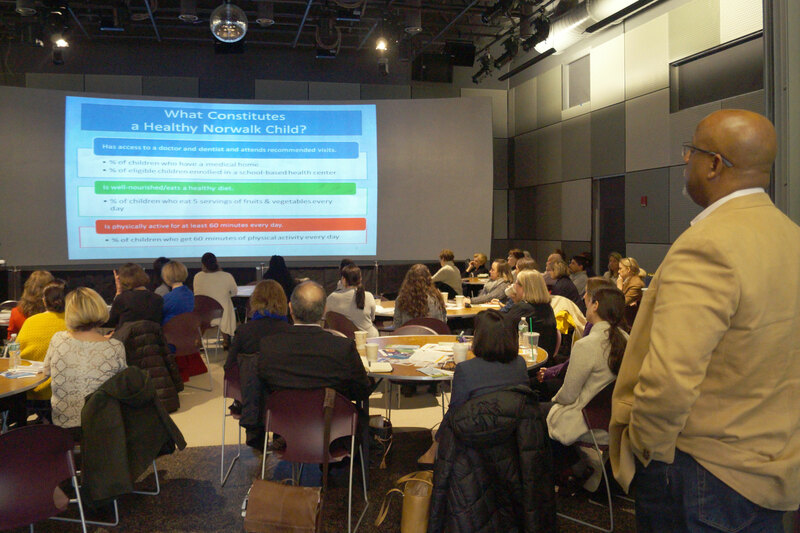 The fist Norwalk ACTS Community Convening of the year kicked off last week with an exciting announcement. Executive Director Anthony Allison has been selected to serve on the Strive Together Member Advisory Council. Norwalk ACTS is part the national Strive Together Network of over 60 communities that are working to improve outcomes for every child, cradle to career by bringing together cross-sector partners around a common vision. Together, the Network impacts over 8.2 million students nationwide. Next on the agenda, Chairman of the Norwalk ACTS’ Advisory Board Dr. Lindsay Curtis updated members about the ongoing work of the Governance Council, and described options for a new anchor entity and home for Norwalk ACTS. He thanked Stepping Stones’ Executive Director Rhonda Kiest and Norwalk Community College President Dr. David Levinson for their support of Norwalk ACTS since its inception. Theresa Argondezzi, Norwalk Health Department Educator and Chair of the Norwalk ACTS’ Health and Wellness Workgroup, began her presentation by acknowledging and thanking the more than 40 community partners who have contributed to recent health initiatives and who, in her words, exemplify Collective Impact by focusing on a common agenda, collecting and using data to drive practice and interventions, and sharing results on what’s working to improve health outcomes for children. The work began after the Norwalk ACTS’ Health and Wellness Taskforce identified the outcomes that define a healthy child: access to medical care, a healthy, eating a well-balance diet and being physically active for at least 60 minutes a day. Armed with this data, Theresa and her team identified programs that would meet these objectives. A committee was also formed, tasked with updating the Norwalk Public Schools’ Wellness Policy, which was passed unanimously last month by the Board of Education. NorWALKers – A neighborhood walking program created with help from the Norwalk Recreation and Parks Department and Norwalk Planning and Zoning Department. Fit Kids – A fun, interactive lesson that teaches elementary school children about nutrition and physical activity, currently offered at nine elementary schools. Eat Well Healthy Restaurants – A regional initiative that highlights healthier menu choices. Theresa is also partnering with Norwalk-based Pepperidge Farm as one of the Campbell’s Healthy Communities (CHC), whose mission is to measurably improve the health and well being of young people in its hometown communities. 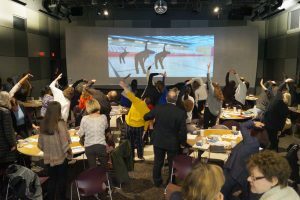 One of the programs currently being piloted at Cranbury Elementary School is GoNoodle, a web-based program designed to increase physical activity in the school day. Teachers can tie the program to their curriculums and also use it for calming exercises or medication. According to the data collected, Cranbury’s fourth graders using the program are receiving up to 14 additional minutes of physical activity a day and report fewer discipline problems. Norwalk ACTS members also got moving and gave GoNoodle a try. One in eight youth living in Fairfield County are considered Opportunity Youth (OY)- not in school and not working. This data point led Fairfield County’s Community Foundation to create a new initiative, Thrive by 25. Other cohorts of youth in need of support are first generation college students and disenfranchised young people, who are underemployed or failing at school. Norwalk Community College is now a major Thrive by 25 partner, providing non-credit certification programs for students to get training which will put them on a clear path to employment. There are currently more than 100 credit/non-credit courses offered at NCC in high demand fields, such as healthcare and technology. Allied Health has also joined the effort, providing career guidance for students, internships and job opportunities. The next Community Convening will take place June 6, 2017.